Saturday was the first day it actually felt like fall outside! I was so excited when I went to the farmers market and didn’t immediately start sweating after getting out of my car. Buuut, then it was a thousand degrees outside on Sunday and absolutely miserable. Sigh. But I couldn’t stand it any longer–I had to make something fall flavored! Many bloggers have jumped headlong into the pumpkin spice, but my favorite fall flavors are apple, cinnamon, and caramel. I’m not knockin’ pumpkin spice by any means, there are just some other flavors that are equally as exciting! 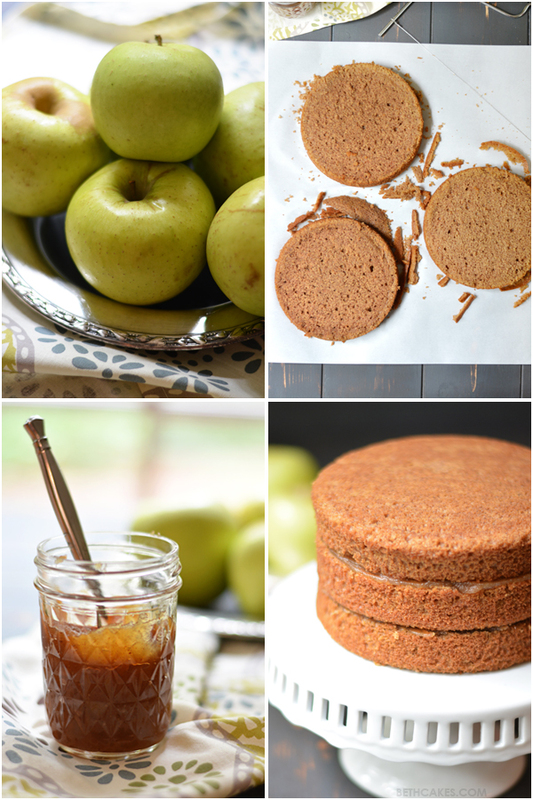 This cake features two of my faves: a cinnamon cake with apple butter filling. This time I decided to play with some fondant and make some fall leaves. I tried really hard to pipe some royal icing flowers, but that failed hard. I’m pretty sure the problem was mostly my fault though. Pretty sure my royal icing wasn’t thick enough, so fall-colored flowers just looked like red, yellow, and green blobs. By the time I gave up on that, I didn’t really have time to make the royal icing again. I happened to have some fondant in the same colors, you know…how you do, and I decided to go with a pile-of-leaves-on-top-of-a-cake kind of look. There were so many options in the second set of booklets from My Cake Decorating, I honestly had a hard time choosing what to make! 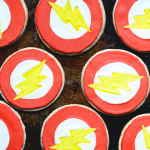 There were mini cakes, petit fours, cheesecake, cookies, and on and on. In addition to the fondant leaves, I also practiced making fondant roses, which I wanted to stick on everything. There were a lot of helpful fondant tips, plus unique and gorgeous ways of decorating cakes with it. Which I guess I’ll just save for another day! Preheat the oven to 350 degrees and line three 6-inch cake pans (or two 8-inch cake pans) with parchment paper and spray with non-stick spray. Combine flour, cinnamon, baking soda, and baking powder in a bowl and whisk together. Set aside. In another medium-sized bowl, beat softened butter on medium speed until smooth and creamy. Add sugar and mix until incorporated and fluffy. Next, add the eggs and mix well. Add half of the flour mixture and half of the milk, and mix until just combine. Repeat with the second half of the flour and milk. Divide the batter equally among the cake pans and bake for 15-17 minutes, or until a toothpick inserted into the center of the cake comes out clean. Cool cakes in the pans for 10 minutes, then let them cool completely on wire racks. Once the apple butter is cool, spread it between the cake layers. Cream butter (that has been browned and turned back into it's solid state) on medium speed in the bowl of a stand mixer until smooth and creamy. Add vanilla extract and milk. Then add half of the powdered sugar and mix on low speed until mostly combine. Bump up the speed to medium and mix until smooth. Add the second half of the powdered sugar and repeat. Mix for another minute. Spread frosting on the outside of the cake. 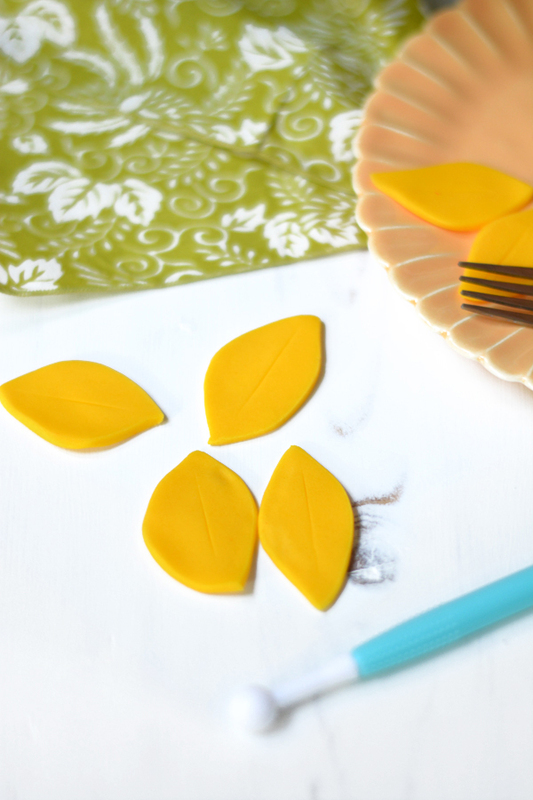 Roll out the fondant to 1/4th inch thick and use a sharp knife to cut out oval-ish leave shapes. Use a rose petal tool to thin out and curve the edges of the leaves and use a knife to press a line into the center. 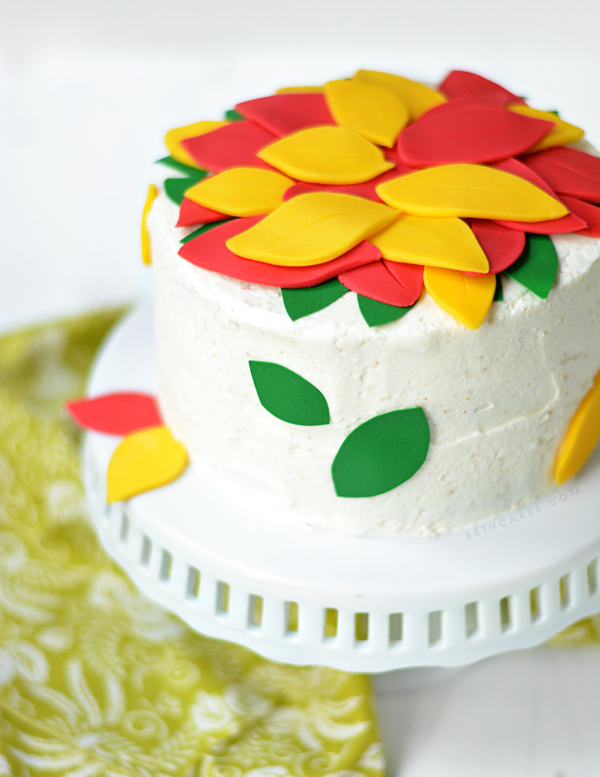 Arrange leaves on top of the cake, and use any extra fondant as glue to hold them in place. THIS IS SUCH A GORGEOUS CAKE, BETH! I LOVE APPLE AND CINNAMON BEST IN FALL TOO. OR REALLY ANYTIME- THOSE ARE YEAR round flavors for me. Love how simple the fondant is, too. lol and I totally didn’t realize caps lock was on. oops. this cake is toooo cute!!!!!! tHE flavors in this cake sound amazing! So fall-ish! And your cake looks beautiful – your decorations are perfect! I totally agree… pumpkin is good and all, but apple is where it’s at in the fall! Love apple and cinnamon and caramel and… oh heck yes! brown freaking butter!!!!! Yum! I love the apple cinnamon flavors as well. the cake looks so delicious! YUM!!! Your skills are amazing. This cake is just beautiful, Beth! I’m totally admiring your cake skills. Pinning immediately! Beth, you keep blowing me away with these beautiful cakes. Like really, can you share some of your decorating talent with us less graceful brethren? I too often find myself saying “because brown butter, duh” and I’m feeling a liiiittle bit guilt about jumping the gun and making something pumpkin spice! But girl, you got me feeling some type of way about this cake. Cinnamon apple + brown butter = yes gawwddd. Such a fun cake, Beth! 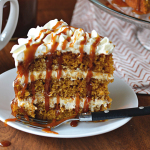 I love the flavors of this cake, perfect for fall! There is nothing like a tasty cake that looks great as well. I am right there with you! I love apples. They are by far my favorite fall fruit or vegetable. 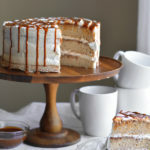 This apple butter cake looks heavenly! Ha! Sounds exactly like our weather here! It will be slightly cooler and then bam, humidity. Boooo. This cake looks amazing Beth. 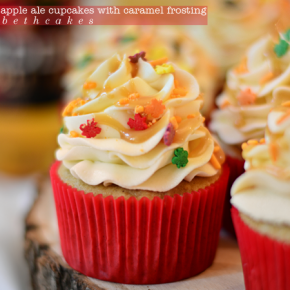 Caramel and apples are two of my very favorite fall flavors! Love it! This cake is so cute! What an adorable cake! Cinnamon Apple butter, yum!! This is just gorgeous! What a fun way to use fall apples. I’m kind of addicted to apple butter. It’s just so good. This cake is on my to make list for the fall. Love! Um, this flavor cake is the bomb. I’d eat way too much of it! And your decorations are gorgeous! This looks Incredible! 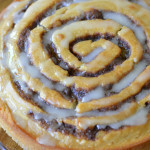 I am going crazy over the picture of the cross section…those layers look so moist! I agree, I also think that there are so many flavors neglected during fall in favor of pumpkin (though i am guilty myself) pinning, hopefully i can make this next week. p.s. why is this entire comment box typing out in caps?! (I haven’t got caps on?!) I am so Sorry if it actually goes through in caps! 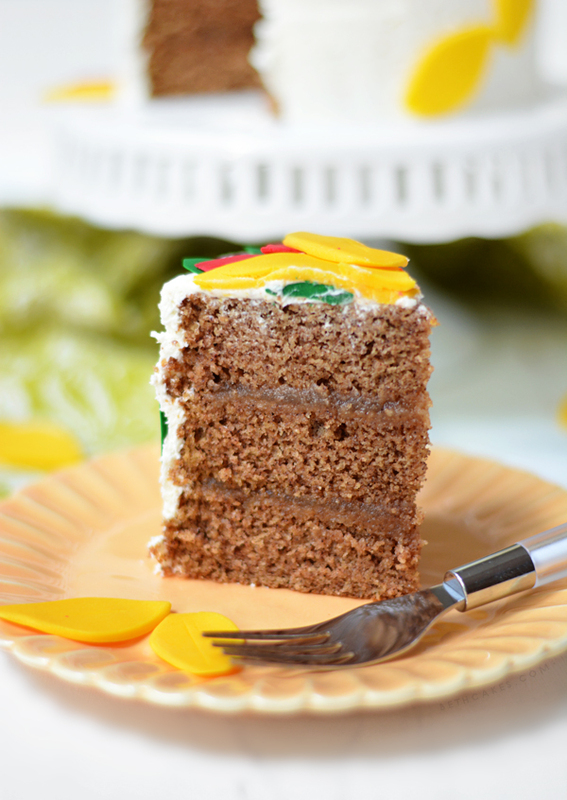 The flavors of this cake sound absolutely perfect for fall! And your fondant leaves turned out so cute. I haven’t working with fondant yet, but this sounds like a great resource! Beth, this is is so beautiful! I’ve been resisting fall desserts because it still feels like summer, but this cake is changing my mind. And I love the cinnamon apple flavors! Beth, this looks incredible! 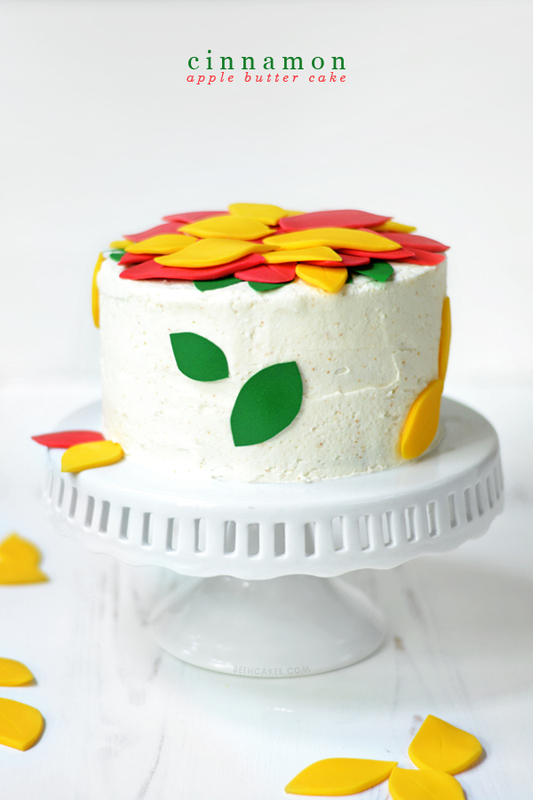 You did an amazing job with the fondant leaves. 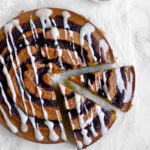 ANd that cinnamon cake? Perfect for fall!